Considering getting a Cocker Spaniel? The Cocker Spaniel, not to be confused with its American Cocker Spaniel cousin, is believed to have descended from the popular spaniel breed in the 13th century. It is an intelligent pooch with a happy disposition and loves being in the company of people. It can get high maintenance in the grooming front especially the show type, which needs to be professionally groomed at least every two to three months. Although it has been bred as a gun dog and would thrive in the countryside, it can do well in apartments as long as it gets appropriate exercise daily. Interested in owning a Cocker Spaniel? Here is a brief background of this cute and endearing pooch also called the English Cocker. 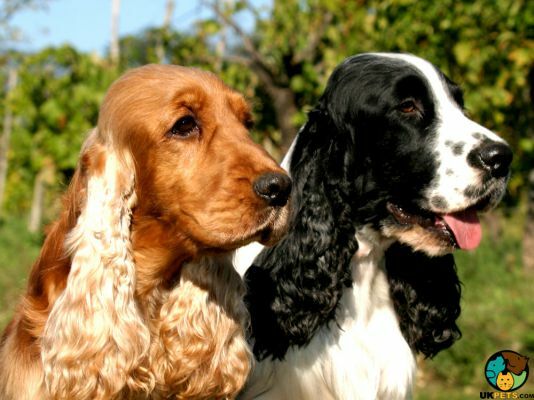 There are two types of Cocker Spaniels: the English Cocker Spaniel and the American Cocker Spaniel. Both are simply referred as Cocker Spaniel in their respective countries. Cocker Spaniels are descendants of the spaniel breed present in the 13th century in England. They were often depicted in various artworks, including masterpieces of Chaucer and Shakespeare. However, it is believed that this type of dog was already around as early as 54 BC. The spaniel dogs were sought after in the 16th century because they were terrific workers as gamebird hunters. It was common for spaniels to have differently sized puppies in one litter. It was up to the breeders to decide which jobs were appropriate for them based on their size, intelligence and stamina. It was only during the end of 19th century that the breeders decided to divide the spaniels into different breeds. These were the Cocker, English Springer, Field, Sussex, Clumber, Welsh Springer, and Irish Water Spaniel. In 1874, spaniels under 11 kilograms were considered Cockers by the Kennel Club. A breed standard for the Cocker Spaniel was officially set in 1885. As American breeders chose the smaller varieties with rounder skulls, shorter muzzles and thicker coats, a separate type was created. The American and English Cocker Spaniels were divided into separate breeds in 1935. 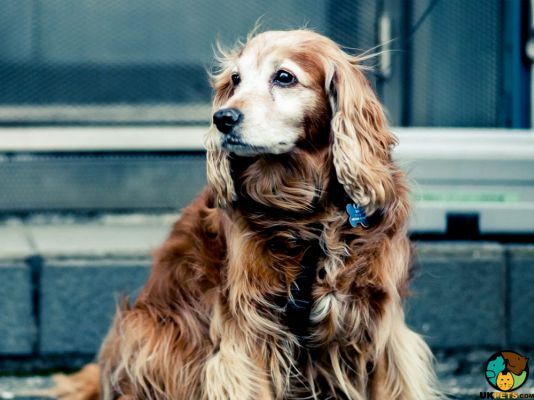 The Cocker Spaniel is a sturdy, compact and magnificent-looking pooch. Larger than its American cousin, it weighs 26 to 34 pounds and stands 28 to 41 centimetres at the withers. Its body resembles the working-dog form of the English Springer and Field Spaniels. Cockers have square muzzles with a well-developed skull and their head is well-proportioned to its sturdy body. Their dark brown/brown eyes are full but not prominent. Their charming lobular ears are set low on a level with their eyes. Solid colours: black, golden, liver, and red. Bicolours: black and white; black and tan; liver and tan; orange and white; lemon and white; liver and white. Roans: blue roan; lemon roan; liver roan; orange roan; blue roan and tan; liver roan and tan. Cocker Spaniels have demanding grooming needs, with the show Cockers being more high maintenance. Their long hair needs daily brushing to remove dirt and distribute natural oils. The coat also needs to be hand- or knife-stripped. Taking them to a professional groomer every 3 months will be a great idea to make your life much easier. Bathing can actually be done as needed. If your dog freely roams around in a farm or ranch, it can get muddy and would require frequent baths. Apart from keeping your dog’s coat clean and healthy, also make sure its nails are trimmed and ears clean. Regularly check for ticks and fleas as these parasites carry deadly diseases. Also make sure its teeth and gums are clean by regular brushing and giving it chew toys that prevent tartar buildup. The Cocker’s intelligence is paired with its eagerness to learn and please its humans, making it very easy to train. It is also worth noting that this breed is very sensitive and does not respond to tough words and actions. Positive reinforcements in the form of praises and treats will work best. Aside from basic obedience, include canine sports in your trainings like agility and flyball. Breed more often than not plays a factor in your dog’s temperament and intelligence. However, not everyone fits the mold. Don’t have too much expectations because each dog is unique. 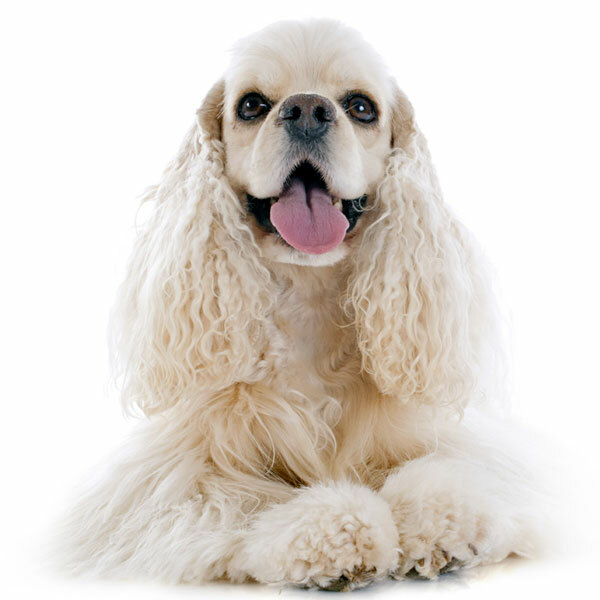 A typical serving for an adult Cocker Spaniel is 1 to 2 cups of excellent quality dry dog food per day. You have to remember that the amount of food you give to your pet depends on its age, size, build, metabolism, and activity level. 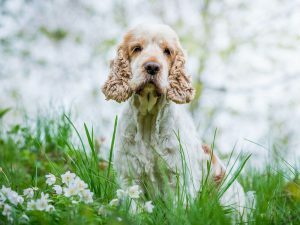 Owners need to have a clear idea of the basic nutritional needs of their Cocker Spaniel as a breed in general and consider its individual characteristics. Whether it is commercial dog food or something homemade, the main ingredient should be real meat. Since Cockers are prone to bone issues, include food that contains glucosamine. Fat found in meat and fish or cod liver oil supplements, is also essential to maintain their beautiful coat. Nonetheless, be careful not to overfeed it as it easily gains weight. Also include good carbohydrates found in oatmeal, rice and barley to provide it with energy all day. Cocker Spaniels are generally healthy but prone to certain health issues, including eye problems like Progressive retinal atrophy (PRA). They can also suffer from Renal Failure, Congenital Sensorineural Deafness, Dilated Cardiomyopathy, and Hip Dysplasia. 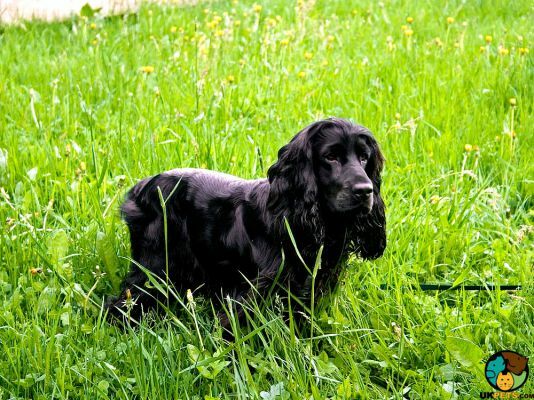 The English Cocker is more energetic than the American breed and has higher exercise requirements. Not being able to release its energy through exercise can lead to destructive behaviour. The best type of physical activity is letting it run around freely in the countryside. On the other hand, if you live in the city, daily walks and runs, paired with games of fetch would also suffice. Don’t leave it in a fenced yard unsupervised or it might escape while chasing other animals. The Cocker Spaniel is a moderately expensive dog to maintain. The annual amount can range from £1,000 to £1,500. Remember that costs differ depending on a lot of factors such as size, age and health. Firstly, premium dog food and treats can go as high as £520 per year. Grooming expenses at professional groomers for your Cocker are around £30 to £40, which can go higher if your dog requires stripping. Routine vet visits for annual booster vaccination and flea/worming treatments can cost around £130. Basic pet insurance rates cost £240 per year but be prepared for any required veterinary treatments not covered or exceeding your coverage. Is a Cocker Spaniel Right for You? The Cocker Spaniel loves people, including children. It generally gets along with other pets but cannot be fully trusted with small animals. It has demanding grooming needs. Originally bred as a gun dog, it has high energy levels and exercise needs. The breed can be destructive when left alone or not exercised regularly. Did you vote for Britain’s Top 100 Dogs Live: 2019 last Tuesday? For those who have missed it, there is no need to worry as we will conduct a review this program featuring canines in diverse shapes and sizes. As early as a thirteen-week-old puppy, a cocker spaniel can be introduced to necessary training. In fact, Northumbria Police have begun training four cocker pups (Henry, Herbert, Hartley, and Hunter) to become the future Northumbria Police specialist search dogs.